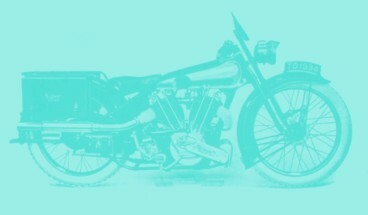 Most Montgomery bikes of the (budget) Bulldog range used a 3-speed Sturmey Archer gearbox, while the up-market Greyhound models used a 4-speed Albion box. Being more of a Brough man I had some reservations about the Albion gearbox, but after dismantling one I have to say it is rather well made. The one I got for my project seems to stem from a Calthorpe bike, but I learnt Albion's just put on this lettering on Calthorpe's request, otherwise the gearboxes are the same. With a tooth count of 30-25-21-18 on the mainshaft and 18-23-27-30 on the layshaft it has gear ratios of 2.78 - 1.81 - 1.30 - 1.0 , tying perfectly in with Montgomery's catalogue specifications. 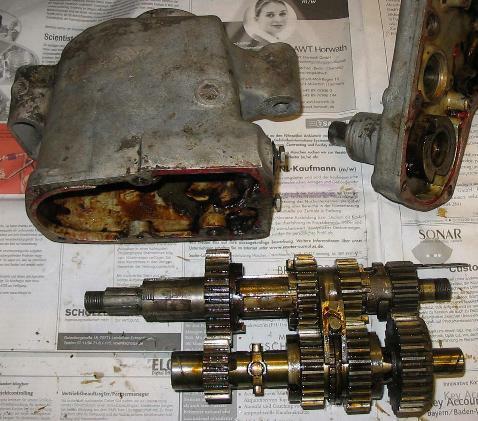 On dismantling it, I found the gearbox in rather usable condition. Unfortunately I forgot to make a photograph of the gear cluster after cleaning it, but I hope you can still see something on this picture. 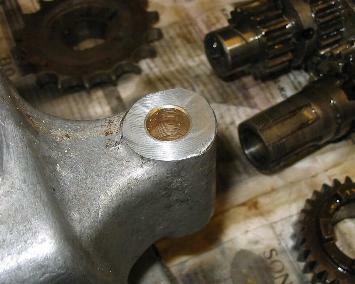 As I mentioned before, the (Indian) Royal Enfield Bullet rear chain sprocket went right onto it's output shaft, and it doesn't seem similarity ends here. 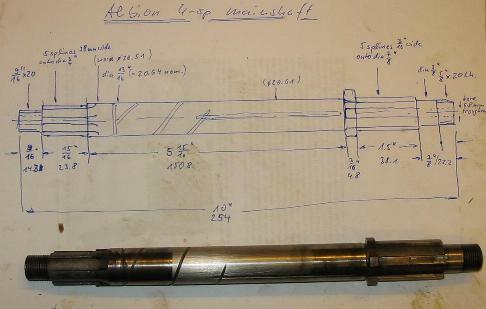 I did some research on the topic, and it would seem the whole design of the Bullet gearbox has not changed a lot since it was copied from the 1930 Albion design. I still need to confirm this, but I think the gearbox internals from the 1950's Enfield singles are the same as the ones you can see here. 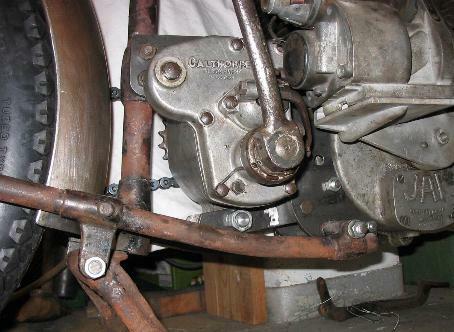 Then, it seems, Enfield made a switch from the 12 DP gears you can see here to a coarser pitch, 10 DP. The 10 DP gears seem to be still in use on the late 1990's Bullet 4-speed gearboxes. It would be very interesting to see if a Bullet gear cluster goes right into this gearbox - has anybody out there got a disused one spare to requirements? The gears looked all well save the dogs of the first gear cluster. I think I can clean them up a bit by careful grinding, but left that for a later time. 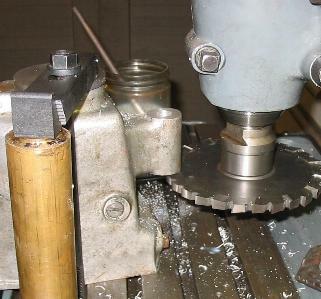 The main shaft is a bit worn near the output sprocket. I will try to get a new one, if possible. I had replaced the two gears on the extreme right, as they were quite worn. These do the main work in first gear. The case looked good as well, no cracks and not even a stripped thread. However, the lug for the pivot bolt at the top was a bit worn, probably due to the bike being ridden with a loose gearbox for a long time. I had to bore it out and re-face the sides, which was not a problem as the gearbox lug needs spacers anyway, being only 2" wide, whereas the engine lugs are 1 1/2". Of course I had to make a bush to bring the bore back to standard. I made it from brass, pressed it in with about 0.05mm oversize and reamed it to 1/2". Other than that, for the time being, I only replaced the output bearing (which is metric! ), cleaned the whole lot and re-assembled it with a bit of oil and light grease. Another anecdote: You can see the (slightly rusty) cover plate on the top of the gearbox. When I got the box, it was missing, and I made a new one because I did not want more dirt to get into the box while the bike was sitting in my workshop. 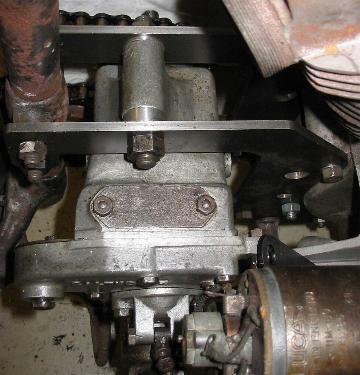 By the way, when I had the whole lot back together, the chain would not run nicely, despite being perfectly aligned. It just would not roll off the (Indian) gearbox sprocket smoothly. I checked the sprocket, and found it was too wide: Normally, a sprocket for a 3/8" chain is something like 9.2mm wide, but the Madras guys went for a full 3/8" (9.53mm), which explained the problem. I thought about machining it down a little. When I had chucked it in the lathe, it wobbled horribly. I thought I'd made a mistake or got some swarf under one of the chuck jaws, but had to find this was due to Indian manufacturing tolerances.